The use of geology to solve crimes in fiction goes back at least to Sherlock Holmes use of different types of mud samples in the 1800s. Fossils, minerals, and chemical composition are clues to where a sample came from, with each rock and each region having its own unique mix of fossils, minerals, and chemical elements. Geological fingerprinting has been used to identify art forgeries, to track the progress of ancient economies, and to uncover ancient political crimes. It is also used in a wide range of scientific endeavors, including understanding the formation of the Moon, locating hidden ore deposits, and predicting the best place to drill for oil or dig a canal. The two classroom activities below are based on real research and use geochemistry or fossils, respectively, to solve puzzles, analogous to the geochemistry and fossils used in our two Issue 9 stories. Fingerprinting Puzzle #1: Did the ancient Mesopotamians use manufactured ceramics or natural stone in their buildings? The conflict in Pele's Tears is resolved by the ability of the protagonist to distinguish between two similar basalts based on chemical compositions. Chemical composition can distinguish materials in many situations in real research. The following puzzle is simplified from the research of Stone et al, 1998, Science Vol 280 pg 2091. Basalt-like stones were used in 2nd millennium BC Mashkan-shapir in Mesopotamia for construction of buildings and grinding of grain. The stones were vesicular gray-black stones. The word "vesicular" means that the rocks contained spherical spaces formed by gas bubbles when the rock was liquid, which tells us that the material had been melted and then re-frozen. Archaeologists wondered if these rocks were quarried at some unknown location and transported to the region where they were used (in which case, the stones were melted and cooled naturally), or if they were somehow manufactured by melting and cooling of some locally-derived rocks or sediments. If the latter, then these stones would provide an example of high-temperature ceramics manufacture from over 3000 years ago. Archaeologists were able to answer the question using geochemical fingerprinting. They compared the composition of the basalt-like stones to other materials from the region and from around the world and realized that there was only one reasonable source for the stones. Can you take part of their data (looking at only two elements instead of the many elements considered by the original researchers) and figure out the answer to the puzzle? The two elements we will look at for this puzzle are Potassium (K) and Iron (Fe). To solve the puzzle, you need to compare the composition of the basalt-like stones used for building in Mashkan-shapir, Mesopotamia, to other rocks and materials from that region of Mesopotamia and from around the world. 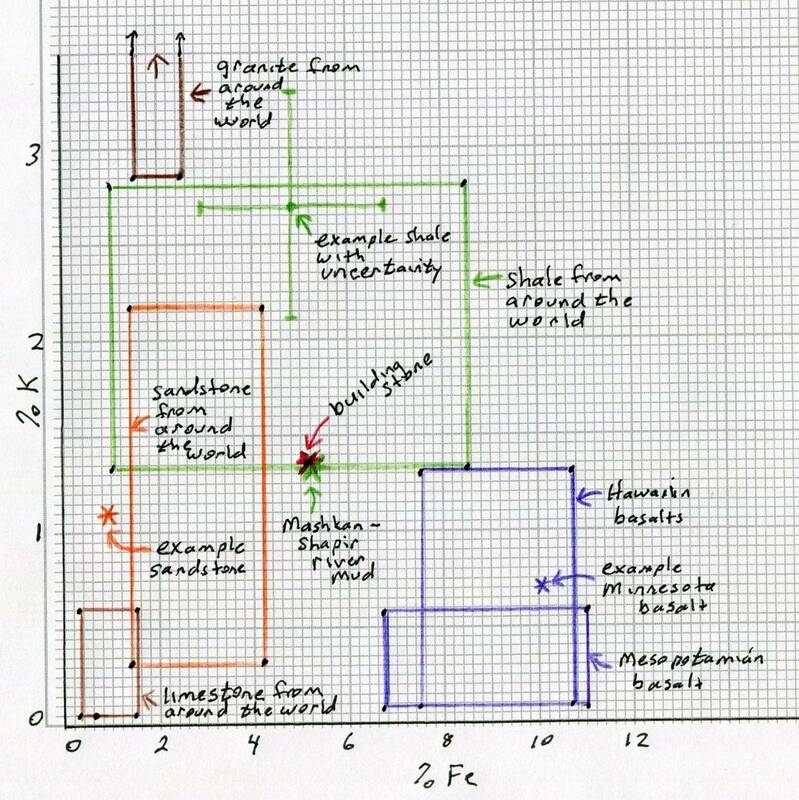 One way to begin is by making a graph on which you plot all the data, including specific points for specific rock samples, and ranges of points for the entire range of compositions that are observed on earth for that rock type (the latter data will plot as an area on the graph rather than a point or a line). First, take some time to figure out how to draw your graph. What values will be on the axes? How do you plot a range of values (an area on the graph)? How do you plot a specific point? How do you plot a specific point that has a reported uncertainty range? After considering the data below, also think about the range of values (scale) that you need to plot on each of the x and y axes on the graph. After plotting your graphs, figure out what you think is the correct origin for the basalt-like building block. Then get with a group and argue from evidence using your graphs. Explain where you think the stones came from or how they were made. Be sure to take into account that all natural materials have a range of compositions, and that whenever we measure composition there is a variation in our measurements—called uncertainty. This means that values will never be single, exact amounts. The range that you see on your graph tells you about how much variation you can expect to see for particular types of rocks. Notice that the building stone does not fall within the natural ranges of either basalt or granite. In fact, the only rock type it overlaps is shale. What's more, the composition of the building stone is nearly identical to a local mud from the Mashkan-Shapir river. This makes it likely that the stones were not natural rock imported from somewhere else, but rather were manufactured locally by melting and then freezing the mud from the local river. Fingerprinting Puzzle #2: Where in England might a murderer have picked up a rock containing particular fossils? The mystery in The Rock Hound is solved by recognizing that particular fossils can only be found in particular locations in Texas. Back in the early 1800s, William Smith, an English surveyor and engineer, was the first to discover that he could predict where to find coal by keeping track of where he found particular fossils. Not only could he know where in England to look, but he could predict how deep the coal would be. He published his work in the book Strata Identified by Organized Fossils (1816). The puzzle below comes from this book, with appreciation to the University of New Hampshire Earth Science Department who provided the maps and images from the now-public-domain book. Suppose that a murderer is on the run, and leaves behind a box of rocks that he collected on his travels (yes, we all know that anyone who collects rocks can't possibly be a bad guy, but let's pretend...). You find two types of fossils in the rocks including shark teeth and a type of coral called Madrepora. 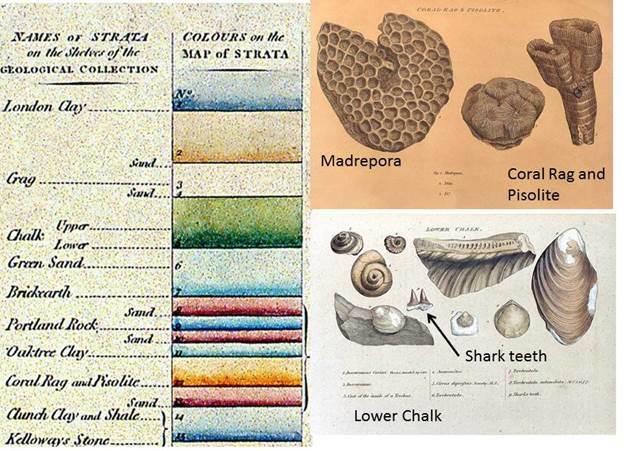 These are two of the fossils studied by William Smith, which he associated with layers of rock that he called the "Lower Chalk" and the "Coral Rag and Pisolite" respectively. Smith's pictures of the fossils, along with his picture of the layers of rock (the stratigraphic column) are shown in the picture below. 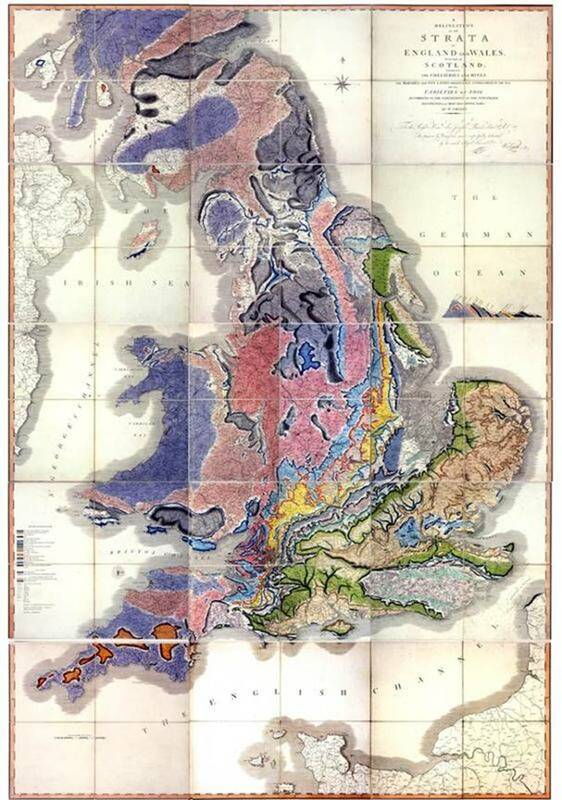 Consider the map of England below, which shows where the different strata (or layers) of rock are found (from William Smith's book). Circle the areas on the map where you think the murderer might have traveled in the past. Then get together with other investigators and discuss why you think that. If the other investigators have a different idea that you do, then try to convince them. Also, listen to their arguments. Connecting to the Next Generation Science Standards. Students can exercise skills in the practices of science including: 1) analyzing and interpreting data—in the Mesopotamian building stone puzzle, students consider how to graphically display the data and deal with the meaning of the uncertainty of the measurements; and in the fossil/crime puzzle students interpret spatial data displayed on the geologic map of England, and 2) arguing from evidence as students use evidence to support their claims about the origin of the building stone or the possible places a criminal may have visited. Students use the crosscutting concepts of 1) patterns in both puzzles and 2) scale, proportion and quantity in the first puzzle as they analyze the compositional data of different rocks and consider the proportion of potassium to iron as a geochemical fingerprint. MS-ESS1-4 Construct a scientific explanation based on evidence from rock strata for how the geologic time scale is used to organize Earth’s 4.6-billion-year-old history. Another Classroom Puzzle for "The Rock Hound"
The Teacher Resources for Geological Fingerprinting are written by Russ and Mary Colson, authors of Learning to Read the Earth and Sky.